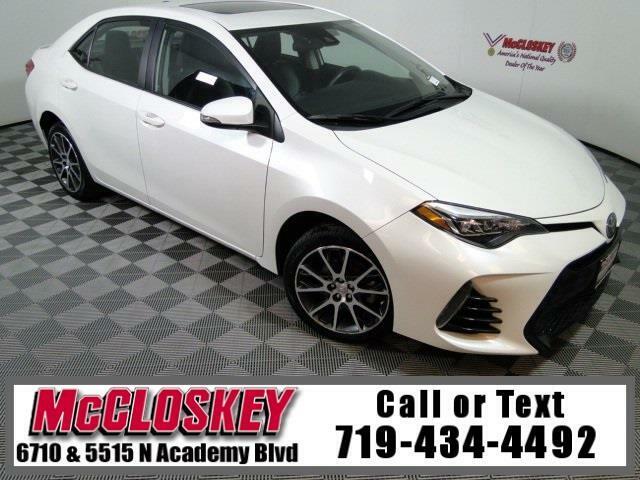 Luxurious 2017 Toyota Corolla 50th anniversary edition with Keyless Entry and Ignition, Power Moon Roof, Lane Departure Warning, and Leather Seats! The SE 50th Anniversary edition adds anniversary badging, gray-painted 17-inch wheels, and upgraded upholstery and trim with Black Cherry contrast stitching. Powering this Corolla is a 1.8L I4 engine capable of producing 132 horsepower and 128 pound-feet of torque! The ride is compliant and shakes off most of what the road can throw at you. This vehicle passed our 110 multi-point inspection and is backed by our National Quality Dealer of the Year Award. We are an ''A+'' Better Business Bureau Rated Business. We offer low interest rate financing, low down payments and the highest trade allowances in the state! Here at McCloskey we do things a bit differently, we shop our competition every day to ensure a great value to you. Come on down and experience it for yourself. This McCloskey Assured vehicle includes a 2 month/2000 mile Warranty and a Vehicle History Report!! At McCloskey we strive to provide ASSURANCE, TRUST, VALUE AND QUALITY! Call 719-434-4492.